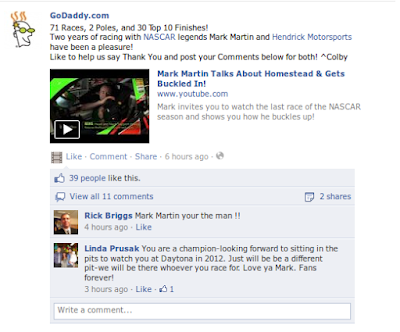 This image was taken off my Facebook news feed and it's a status update from godaddy.com. Yes, I had my site's domain name registered with them. I decided on godaddy based on feedback from my friends on, you guessed it, Facebook. Godaddy's status update was not even about domain names. They were talking about something that was of interest to their target audience. Take notice of the number of shares, comments and likes. That's a lot, isn't it? Each time there is a response to godaddy's update--someone makes a comment, shares the content or simply hits the like button, godaddy's update goes back to the top of the news feed. It doesn't get buried under all the other news feed. People are then made more aware of the interaction, and seeing friends they know are connected with the brand, they too will want to be associated with the brand. You don't need 10,000 likes on your facebook fan page to get that. All you need are handful of people who are happy with your brand and are not shy about it. Next time someone in their network asks for recommendations on domain name registration, guess which brand comes off the top of their mind?